Hi everyone, Pat Sloan here, we have some fun things to share, so I wrote them in their own article! Our Splendid Sampler 2 book will be shipping very soon. If you pre-ordered the digital version it has already sent, so you’ve seen what our amazing team designed for us. Jane and I want to give you the scoop on how ‘Sew the Book’ will work. Thursdays – Posts will continue to be one every Thursday. Nov 8, 2018 to April 18, 2019 – Sew the Book and meet the rest of our design team! Bonus Blocks – Watch for them as we’ll have a few sprinkled through the sew along! Block List – We have a handy list of block names at the end of the book so you can keep track of which ones you have made. Since you have the book, the surprises will be what blocks to sew each week and getting to know the designers. And our Facebook group is open 24/7, year round, and for years to come. So if you have not joined our community CLICK HERE to be inspired, get help, and meet new friends! We are thrilled you joined us to kick off the Splendid Sampler 2. We still have a few more weeks before we start in on the book. Plenty of time to order a hard copy + tack on the digital as it’s worth having for printing the shapes instead of tracing them out of the book. We designed our Splendid Sampler books to be a skill builder. Our amazing design teams take you through every technique you can think of and then toss in a few more! This week you can take advantage of a FREE Trial subscription to Bluprint and try out ALL the online workshops for yourself. Some are even taught by our design team members. Now through October 12th, thousands of expert-led creative classes, projects, recipes, patterns, and more are FREE to try. Jump in and Improve your skills. Beside quilting and embroidery, explore 20+ categories and dive into all sides of your creativity. Everything’s FREE during the Get Started Event, on now! *** Such as the class above, watch the amazing TiPS! You can go from “I wish I could” to “look what I did!” and who doesn’t want that? 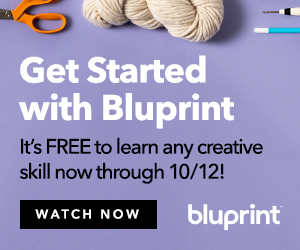 Now through October 12th, thousands of expert-led creative classes, plus projects, recipes, patterns are free for you to watch and see how you like Bluprint. Explore more than 20 categories, from quilting (of course!) to knitting crochet, cooking and loads more.